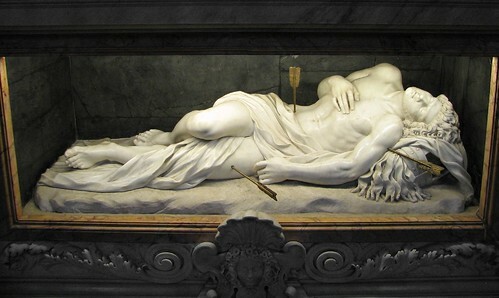 Today is the feast of St. Sebastian, who is also the patron of the church I attend. In honor of our patron saint, our parish commissioned a hymn which premiered at mass last year. After all, it's not like there are lots of St. Sebastian hymns to choose from! St. Sebastian was born in Gaul (a piece of land near modern day France and Belgium). He traveled to Rome to be a soldier and became a captain under the Emperor Diocletian. He was responsible for converting many to Christianity and many miracles were attributed to the saint. He is most often pictured bound with arrows poking out of his body. He was seriously injured and left for dead. I have heard that the reason he wasn't killed was that his fellow soldiers couldn't bring themselves to make an absolute kill shot on a fellow soldier. Nonetheless, St. Irene found him barely alive and carefully tended him back to health, and I might add, without the help of antibiotics! She must have been extraordinarily gifted. Nonetheless, he recovered his health and went back to persuade/confront Diocletian again - and was successfully murdered for his trouble. I often ponder how St. Irene must have felt about that! Personally, I think I would have knocked him over the head to keep him away from the evil emperor - which is probably why she is a great saint and I'm not. Usually, my parish hands out chocolate arrows to the school children and PSR students. But as a family, red velvet cake is always a nice way to celebrate a martyr. There once was a lady whose name was Irene. 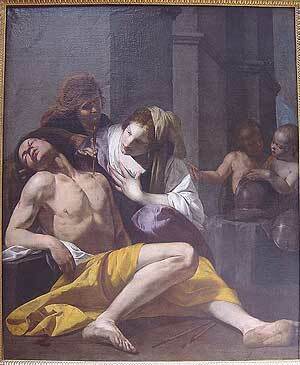 She found St. Sebastian and made his wounds clean. She lives now in heaven with Mary our Queen. Mr. Pete scoffs at this - I challenged him to make up one of his own, which he has yet to do! It's not as easy as it seems. The artwork above was commissioned by my parish and is displayed for St. Sebastian's feast day every year. The Basilica of St. Sebastian on the Apian Way. 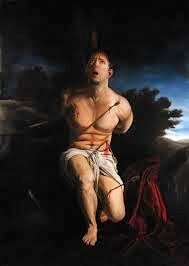 Images of St. Sebastian in art and iconography.